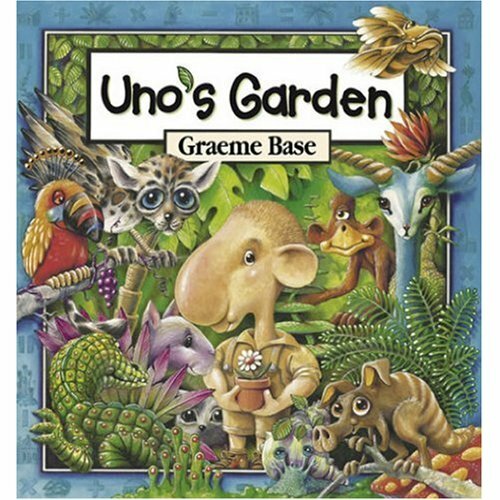 Uno’s Garden is a tale of a magical, mystical forest full of amazing beasts and fascinating plants where Uno arrives to set up house and a little garden in one small corner. One by one, fishermen, hunters and tourists follow him. 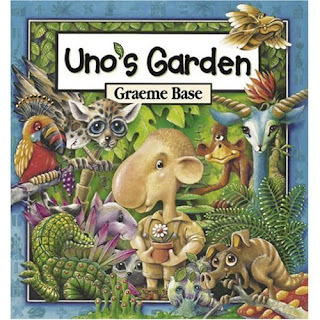 As Uno grows his garden, more people arrive, more houses are built, and the small corner becomes a village, then a town, then a city. We keep track of the growing and sliding numbers on the top right corner of each spread. The population of plants starts out at 100 and exponentially decreases, while the houses double. Transportation is built, scientists visit but find few animals left; and while the number of buildings have gone up to a staggering 64, the number of plants have spiraled down to 1. Very soon, all that is left of the place where there was once nothing but forest, is one lone tree with one lone leaf. On this bleak page, where the multiple shades of lively forest green once greeted the eye, all we see now is the bland industrial green of the city and the revolting green of its sewer underneath. Finally, when no plants are left and one species comes to extinction, the people inhabiting the buildings awaken to the reality. They miss the trees and abandon the city. Amidst its rubbles, Uno’s little garden still survives. It starts off as one single tree next to one modest shack. Uno doesn’t live long enough to see it grow any more, but his kids take up where he left off and care for it so much that the animals start to return one by one, in a slow serial progression. The process of restoration is much, much slower than the destruction, but it keeps moving forward, on to the next generation. Slowly, we reach a two-page spread where we see the lush greenery back in the forest, the fantastical creatures back in their habitat, living right alongside, and in harmony with the people. The interesting thing to note is during the restoration process, it is not that the population of people dwindles, it is just that the growth is more controlled, buildings rise up at a much slower pace and instead of tall high-rises, they are eco-friendly "Wigloos" and "Mush Rooms". In every facet of the restoration, balance is the key. This is one book that you could peel different layers each time you read. Read it once for the arithmetic and the number games hidden within the decreasing and increasing populations. Read it once to smile at the humor behind the nomenclature - for creatures called Gondolopes (they look like beautiful blue antelopes) and plants called Schmushlemush (squishy looking red polka dotted mushrooms). Read it many times for the art, for the complex illustrations of this fantasy world that invite you to step in and count the Puddlebuts and Lumpybums (yes, those are creatures, I leave it to you to imagine what they might look like!). Read it once for the mysterious and underappreciated Snortlepig. the whole way back to ten again! If we count our planet's care as one of our top priority, maybe, just maybe we can go back half-way, if not the whole, to its original, untarnished beauty. Sounds very interesting. Good timing of the review - around the Earth day. Recently read a couple of books on Global Warming and really feeling sad for the sorry state of affairs when it comes to how humans are abusing the earth and its beauty for all generations to come. A recent find from our LL, this book was a great hit with K. She wouldn't put it down. Incorporating the Math to explain environmental deterioration was very clever, wasn't it? We love Graeme Base. Lots of offbeat, mix of realistic/fantasy picture books to his credit. As always, beautifully written. Crisp and clear. :) Thanks, KM! Lovely pick, KM, and wonderfully presented here, as always! As you said, books with many layers have a lasting appeal. The cover you have included here is so lush and typical - reminds me of The Water Hole by Graeme Base which happens to be the 2 yr old's current favorite. Reminds me of the review of another book called The Curious Garden by Tharini.